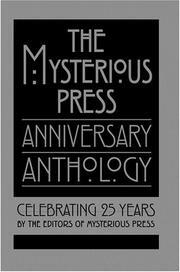 As founding publisher Otto Penzler notes in his ebullient foreword, the Mysterious Press, the nation’s leading publisher devoted exclusively to mystery and suspense fiction, issued its first titles in 1976. Now Warner, which bought the press in 1989, has commissioned 18 new stories, several of which manage to smuggle in anniversary themes, from a star-studded cast of Mysterious regulars—M.C. Beaton, Charlotte Carter, Jerome Charyn, James Crumley, Lindsey Davis, Loren D. Estleman, Joe Gores, Robert Greer, Stuart M. Kaminsky, Joe R. Lansdale, Peter Lovesey, Margaret Maron, William Marshall, Archer Mayor, Ed McBain, Marcia Muller, Beth Saulnier, and Donald E. Westlake—to produce the perfect bedside companion for well-wishers who want to celebrate into the wee hours.